Seeking Health Optimal Prenatal is a complex dietary supplement designed for women planning pregancy, pregnant and breast-feeding women. The formula contains nutrients recommended to women which supports health of a mother and child. It includes a unique blend of amino acids, chelated minerals and vitamins. The nutrition of pregnant women is one of the most important environmental factors to the course of pregnancy and child development, both during the foetal stage, childhood and adult life. A proper amount of nutrients is a key factor in health of a child and mother. B vitamins are primarily responsible for a healthy nervous system. They stabilise mood and improve memory and concentration. A deficiency of these vitamins can be the cause of bad mood, neurosis or even depression. The formula contains a complex of B vitamins - riboflavin (vit. B2), thiamine (vit. B1), niacin (vit. B3), pyridoxine (vit. B6), biotin (B7), pantothenic acid (B5) and also vitamin B12 as cobalamin and adenosylcobalamin. Vitamin D3 takes part in maintenance of calcium-phosphate balance and is critical to normal calcium absorption. Vitamin D3 deficiency may have a negative impact of fetal skeleton and also increase the loss of calcium from bones of a pregnant women. Vitamin A, C and E have strong antioxidative properties. These vitamins capture free radicals and hinder the oxidation of unsaturated fatty acids and phospholipids. Vitamin K has a significant role in homeostatic processes. Vitamin K deficiency may be the cause of a deficit in coagulation factors which may consqeuently lead to bleeding in infants and newborns. All minerals contained in this formula are in well-absorbed, patented forms (DimaCal®, Albion®, TRAACS®) which facilitates their highest biological activity in the body. Chelate elements do not only effectively make up deficiencies but also protect from their excessive accumulation and reduce the risk of poisoning. Like vitamin D3, magnesium and calcium are critical to healthy bones and also help normalise blood pressure. In addition, they contribute significantly to regulating the nervous system. Iodine is involved in the production of thyroid hormones which play a key role in, among other things, normal development of the nervous system and brain function. Iodine deficiency may cause birth defects and psychomotor developmental disorders of a child, e.g. ADHD. Selenium, like iodine, participates in the synthesis of thyroid hormones. It has been shown that the use of selenium in pregnancy may reduce the risk of postpartum thyroiditis. Copper takes part in red blood cell production, boosts immunity and supports the nervous system function. Zinc is involved in many enzymatic reactions and mechanisms responsible for getting through pregancy and healthy fetal development. Zinc deficiency during pregnancy may be the cause of premature birth, low birth weight or delayed growth and mental development. Manganese participates in the synthesis of nucleic acids and proteins. Molybdenum strengthens the body's defence mechanisms. Chromium improves glucose metabolism and carbohydrate tolerance in diabetics which may be especially important in gestational diabetes. Potassium maintains water-electrolyte balance, regulates neurotransmission and is critical to normal muscle contractility. C677T mutation in the MTHFR gene contributes to impairing the process of folate metabolism in the body. Unfortunately, the body of such individuals does not absorb poorly metabolised folic acid which leads consequently to deficiency. It is presumed that this mutation can be carried by every other woman. Folic acid affects the stability of the child’s genetic material and prevents foetal neural tube defects. In addition, folic acid takes part in the conversion of homocysteine into methionine which supports a healthy cardiovascular system and reduces the risk of thrombosis. Because of that, the most serious effects of folic acid deficiencies concern expectant mothers. To take care of mother’s and child’s health, the formula contains both the highly bioactive and well-absorbed methylated folate (5-MTHF) and the non-methylated folinic acid. Choline increases acetylcholine synthesis and promotes cognitive functions. Coenzyme Q10 shows a strong antioxidant action and supports energy production in the body. Inositol and ginger improves insulin sensitivity. Betaine HCl promotes digestive processes and improves absorption of nutrients. L-carnosine improves cardiovascular function, has neuroprotective properties and maintain glycaemic balance. Lutein has antioxidant properties and supports the eyes in protection from harmful UV radiation. Taurine stimulates the body’s regeneration processes. Red raspberrry leaves improve circulation, support digestion and have a beneficial effect on the condition of the uterus. Milk thistle shows hepatoprotective properties. 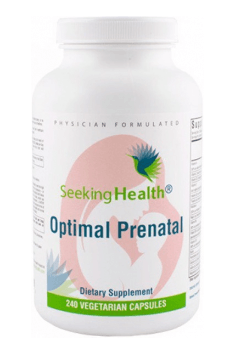 To sum up, Seeking Health Optimal Prenatal is a dietary supplement which helps replenish nutrients which are especially crucial during pregnancy. The formula combines all nutrients whose levels are vital not only during pregnancy but also when we are planning a child and breast-feeding. HPMC (capsule), ascorbyl palmitate, medium-chain triglyceride oil, silica, and L-Leucine.